At the recent meeting of the TTC Board, Vice-Chair Alan Heisey proposed that the TTC and Metrolinx Boards should meet regularly to discuss issues of mutual interest. Such a meeting took place a year ago, but despite the best intentions at the time, nothing further came out of this. As Heisey said “It’s not as if we don’t have things to talk about” citing fare integration, Presto, the Crosstown project and SmartTrack. Using fare integration as an example, with some discussion already afoot about just what this entails, it will be better to have these discussions earlier rather than later, said Heisey. The TTC should be in front of discussions on how an integrated system will be structured in Toronto. Heisey went on to mention that at a recent meeting of the Toronto Railway Club, of which he is a member, he learned things about the Crosstown contract he did not know such as that the operation of the Mount Dennis yard will not be done by the TTC, and that although the TTC is supposed to be operating the line, the company delivering the project would really like to do this work. This is the sort of information Heisey hopes would come out in a joint meeting, and he proposes that the TTC host the event (as Metrolinx did in 2016). It is no secret that far more information is available outside of formal Board meetings at both TTC and Metrolinx than one ever hears on the record. Those of us who attend Metrolinx meetings regularly know that “information” is thin on the ground at these events where the primary function appears to be telling the staff how wonderful they are and luxuriating in the ongoing success of everything Metrolinx, and by extension the Government of Ontario, touches. “Seldom is heard a discouraging word” could be the Metrolinx motto. Indeed the TTC has become infected with a similar problem recently where whatever new award(s) they manage to win take pride of place at meetings while serious discussion about ridership and service quality await reports that never quite seem to appear. Budgets do not offer options conflicting with Mayor Tory’s insistence on modest tax increases. Getting an award for the “We Move You” marketing campaign is cold comfort to people who cannot even get on a bus or train because there is no room. Oddly enough, when TTC Chair Josh Colle contacted his opposite number at Metrolinx, Rob Prichard, the word back was that such a meeting might have to await the appointment of a new CEO. The position is now held on an acting basis with the departure of Bruce McCuaig to greener pastures in Ottawa. That is a rather odd position to take. Is Metrolinx policy and strategy so beyond discussion that without a CEO, they cannot have a meeting? How is the organization managing to push trains out the door, let along host an almost endless stream of photo ops for their Minister? Commissioner De Laurentiis agreed that there are many issues, and warmed to the idea, but suggested an information sharing/exchange session as opposed to a formal meeting. She concurred that the type of information Heisey is gathering “accidentally” should come the Board’s way formally. These do not include the operating agreement for the line because, I believe, it does not yet exist beyond a draft format and the intention is not to formalize it until a few years before the line opens in 2021. However, aspects of the proposed agreement are certainly known to TTC staff. Whether their interpretation matches Metrolinx’ intent is quite another issue. Other topics for a joint meeting suggested by Commissioner Byers included Accessibility, and the working relationship between Metrolinx and Infrastructure Ontario including the topic of risk transfer. For those who have trouble sleeping, the Crosstown agreement makes interesting, if tedious, reading. One section deals for pages on end with the contractual arrangements between Metrolinx who will procure and provide the fleet, and the project provider who must test, accept and operate (or at least maintain) the cars. This is a perfect example of the complexity introduced by multi-party agreements with the 3P model. Each party must define at length its roles and responsibilities where a consolidated organization would deal with the whole thing in house. Of course some would argue that this simply shows how keeping parts of the overall procurement within Metrolinx adds layers of complexity that a turnkey solution might avoid. That’s a debate for another day, but an important part of any future project design. Chair Colle observed that just because you invite someone over to your house, they don’t necessarily accept, and the TTC could find itself without a dance partner. Heisey replied that we should invite Metrolinx to dinner and tell them what the menu will be. Dinner invitations are often accepted. Colle observed that any one or two of the suggested items could “keep us well nourished”. Mihevc added to the list by suggesting both the Finch and Sheppard LRT projects. That should be an amusing discussion considering that Metrolinx and City Planning have gone out of their way to be agnostic on the subject of Sheppard East’s technology considering that there are Councillors and (Liberal) MPPs who would love to see a subway extension there, not LRT. Both Boards, not to mention their respective management teams, would go to great lengths to avoid implying any sort of commitment beyond the next announcement of another GO parking lot or a long-anticipated subway extension’s opening date. The biggest problem with the Metrolinx-TTC relationship is the province’s heavy-handed approach whereby any move away from the “official” way of doing things will be met with a cut in subsidy. Indeed, despite increasing outlays from Queen’s Park on transit, they keep finding more ways to charge Toronto for their services. The City gets more money on paper for transit, but spends some of it to buy provincial services in a monopoly market. Even if Metrolinx invites Toronto to dinner, they will expect the City to foot the bill. As a public service, if only to forestall imminent starvation of the TTC Board, the balance of this article explores some of the issues raised by Commissioners. The video record of the TTC debate is available online. Has John Tory Discovered Life After SmartTrack? With all the flurry of transit funding and construction announcements lately, Mayor John Tory added his own contribution with a media statement at that busiest of stations, Bloor-Yonge. What prompted such a high-profile event? Rumour has it that Queen’s Park plans to fund the Richmond Hill subway extension in its coming budget, and Tory wants to be sure he defends the existing downtown system against overloading from the north. This is brave stuff, our Mayor rallying his city to the barricades [cue inspirational and very-hummable anthem here] were it not that Tory himself is responsible for much of the confusion and misdirection in transit plans today. His election campaign promoted “SmartTrack”, a single city-wide project that would solve every problem and magically be funded through taxes on new development the line would bring. A “surface subway” would speed riders from Markham to Mississauga via downtown with frequent service at TTC fares. Nothing else (except for a politically unavoidable subway in Scarborough) was needed, certainly not better bus and streetcar service to fill all those spaces in between major routes. Things didn’t quite work out as planned. SmartTrack has dwindled to a handful of new GO stations to be built on the City’s dime, some of which Metrolinx might have built anyhow, and a few in locations of dubious merit beyond their soothing effect on local politicians. With the demise of a scheme to run GO trains along Eglinton from Mount Dennis to the Airport district, the Eglinton West LRT extension is also on the table, but it stops short of its necessary end, the airport, because Toronto lopped off the outside-416 segment to reduce the cost. Whether Mississauga and/or the airport authority itself will contribute to the LRT remains to be seen. Tory discovered that surface routes suffered under his predecessor, and vowed more money for buses. Toronto bought the buses, but money to actually operate many of them is harder to come by. The only thing that saved the TTC from widespread service cuts in 2017 was a last minute City budget fiddle to bump the expected revenue from Land Transfer Tax. Meanwhile in Scarborough, SmartTrack and the Scarborough Subway Extension vie for the same pool of riders, and it is only the comparatively infrequent GO service that preserves any credibility for the subway extension. Planners who once argued that an east-west line through the Town Centre precinct would better serve future development now compliantly endorse the supposed benefit of a single new north-south station between McCowan and the shopping mall. Mayor Tory might now think of both ST and the SSE as “done deals”, although there’s a lot of ground to cover before the final cost projections and approvals by Council. 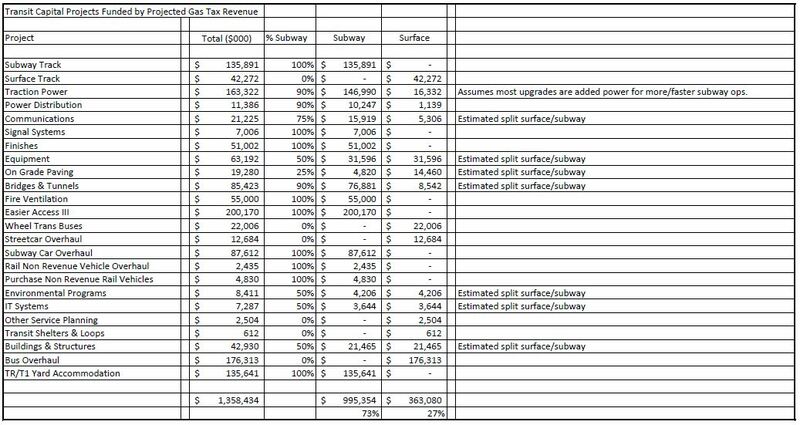 Those extra GO stations and the express subway might still cost more than the preliminary estimates shown to Council, but there’s no more money coming from Queen’s Park. Indeed, the two governments cannot agree on how to calculate inflation in the provincial “commitment”, and Toronto thinks more money is on the table than is likely to be available. After all, Tory is in no position to tell a funding government how much they will pay out. Even those numbers are subject to change if the Liberals lose control of Queen’s Park to the Tories, as seems very likely in 2018. Then there’s Ottawa and Trudeau’s huge infrastructure program, just the thing a politician who is desperate to make everything seem affordable could wish for. Except, of course, that the infrastructure pot isn’t bottomless. Once it is divvied up across the country, Toronto’s share is well below the level John Tory hoped to spend with his shiny new Liberal red credit card. Holding press conferences about the need for projects won’t change the amount of money available, and the federal program requires that municipalities, even big irresponsible ones, must set priorities. Tory’s plans also require Queen’s Park to come in with funding equal to the Fed’s contribution at a time when provincial budgets are tapped out, and Toronto’s ongoing game of holding down taxes rather than pay for its own services and infrastructure plays poorly beyond the 416. What does the Mayor do? John Tory, the man who had a one-line plan to solve everything, now looks to a world beyond SmartTrack. After a day-long debate, Toronto Council has approved continuing along the path set by Mayor John Tory to study and possibly to build the transit lines branded as “SmartTrack”. Although this proposal is now much different from the scheme that was Tory’s campaign centrepiece, the idea of SmartTrack continues to receive broad support among Councillors. The debate covered a lot of ground with two related threads: how would Toronto actually pay for SmartTrack, and how much of the larger transit network many hope to see will actually be built. Council has yet to consider a long-term financing strategy and possible “revenue tools” (new taxes in plain English) to deal with the combined capital and operating budget demands of the would-be network. Although there was much talk of the lost decades of underinvestment in transit, Council has yet to show that it really is ready to spend Toronto dollars (as opposed to money from any other source) at the level that will be needed. City staff will present a report on financing options in a few weeks, and the reaction to this will be telling. Below is a consolidation of the staff recommendations and amendments adopted by Council arranged to keep related issues together. For full information, please refer to the detailed record of the item. Note that in all cases where approvals relate to “SmartTrack” this includes both the six new GO stations and the Eglinton West LRT extension unless otherwise noted. (1) Adopt the “Summary Term Sheet and Stage Gate Process” which includes details of the many parts of the proposed agreements and (2) authorize the City Manager to negotiate and execute agreements with the province to implement this. (3) Request staff to report at Stage Gate 5 for final approval of full funding for SmartTrack. A report on more definitive costing and the financing funding strategy has been requested for an earlier step in this process. See (18) below. (4) Approve the confidential staff recommendation regarding settlement of the Georgetown corridor funding issue. See also recommendation 15.
pedestrian connections to the existing Exhibition Place Station for both Liberty Village and Exhibition Place. Amending the development strategy for public lands at stations, including air rights, to create ongoing operating revenue streams from development resulting from that strategy. Directing the Chief Planner to report in January 2017 with options to develop a comprehensive plan for managing development and growth related to transit expansion. Confirming that the Official Plan as well as other plans, bylaws and policies, are not changed by this decision on this item. The intent of this is to forestall any claim for additional density by would-be developers in advance of the passing of updated plans for area affected by transit projects. (7) Proceed with planning and analysis of the Eglinton West LRT extension up to Stage Gate 3 including finalization of stops and grade separations, provide a scope for this project up to the Renforth Gateway, and provide a class 4/5 estimate of the project’s cost, and conduct the TPAP. Note that this is a more restrictive approval seeking more detail than in the case of the ST/GO stations in (5) above. (8) Request a financial contribution from Mississauga and Pearson Airport to the outside-416 portion of the Eglinton West extension. (9) Ensure that the proposed new station design at St. Clair and Keele includes improved road operations and is co-ordinated with the St. Clair West Transportation Master Plan. A significant part of this would be the widening of the underpass east of Keele Street to remove the existing choke point. (10) Request Metrolinx to consider grade separations at Progress and at Danforth on the Stouffville corridor, with the proviso that any option closing existing roads would not be considered. This was amended at Council to add requests for grade separations at Passmore, McNicoll, Huntingwood and Havendale. At Council, there was an attempt to have items (7) and (8) deferred until after the Waterfront Transit Reset report is considered by Council in 2Q17, effectively putting both of the proposed Etobicoke LRT proposals on the same approval timeframe. The deferral motions did not pass. (14) Include $2b in net capital requirements for SmartTrack (stations plus LRT) in the city’s 10 year capital projections. (15) Approve $95m for settlement of the Georgetown South issue with the province. (16) Approve $62m for Toronto’s share of 5 grade separation projects. (17) Approve $60m for GO capital expansion (2 stations at Bloor/Lansdowne and at Spadina on the Barrie corridor). This was amended to ask that staff work with Metrolinx on including the study and design of the Railpath along the Barrie line between Bloor and Dundas West. (18) Request staff to develop the financing and funding strategy, and report back when a class 3 cost estimate is available for a definitive Council commitment to the SmartTrack project. negotiations with the province for resumption of operating subsidies. Commitment to the full cost of the new stations and the Eglinton West LRT will not occur until much more detailed cost estimates come back to Council over the next year (or possibly more). In the event that Council opts not to proceed with any component for which Metrolinx has spent money on development prior to the point of final approval, Council will be responsible to reimburse Metrolinx for its costs. With respect to the additional grade separation studies requested for the Stouffville line, it is unclear how work on this would be funded, although one might expect Metrolinx to respond with a request for some up-front payment and guaranteed participation in funding if any of these goes ahead. Planning and building any part of SmartTrack should be seen in the wider context of other transit needs and schemes, let alone wider demands on the city’s operating and capital budgets. The Spadina Subway extension to Vaughan (TYSSE) is scheduled to open at the end of 2017, although startup costs will affect the TTC’s operating budget before any passengers are carried. For 2018, the current estimate of the annual operating cost to Toronto is $30 million including whatever marginal fare revenue the extension will bring in. This line’s capital was covered roughly one third by each level of government, with about 60% of the municipal share falling to Toronto based on the proportion of the route within its boundaries. The Scarborough Subway from Kennedy Station to Scarborough Town Centre remains the subject of much debate. Although its capital cost is already covered by money from all three levels of government, the proportions are unequal, and any increase to the overall Scarborough transit scheme will be on the city’s tab. The extension will be part of the TTC’s operation along with the net new operating cost, an unknown amount at this time. A critical issue will be whether the cost estimate overall will hold or increase before final project approval, and how this will affect what actually gets built. The Eglinton Crosstown LRT is now under construction by Metrolinx between Kennedy Station and Mount Dennis (at Weston Road) with a planned 2021 opening, subject to issues about vehicle delivery. This project’s capital cost is funded totally by Ontario, but operating costs will be billed back to Toronto at an anticipated annual net amount of about $40 million in then-current dollars. The Eglinton East LRT extension from Kennedy Station to University of Toronto Scarborough College is part of the Scarborough package approved with much fanfare earlier in 2016. The capital cost is part of the same “pot” as the Scarborough Subway extension, but how much will actually be available after that extension’s scope and price are firmed up remains to be seen. This will be an early test for Council. Does it really believe in a “network”, are councillors willing to accept the extra cost as part of building our city, or is the argument still dominated by an outlook claiming that tax restraint must take precedence. An updated Scarborough report is expected in coming months. The Eglinton West LRT extension from Mount Dennis to the Renforth Gateway (at the western city boundary) and then north to Pearson Airport is part of the SmartTrack package. Funding for the line is still uncertain because city plans depend on contributions from Ottawa (likely as part of the Liberal’s infrastructure program), from Mississauga and the airport authority (GTAA) for the portion outside of Toronto. This extension is now the more expensive portion of “SmartTrack”, and ironically appears to survive mainly because of that branding despite opposition from some Etobicoke councillors. Like the central part of the Crosstown, the two extensions would be operated at the city’s expense even though the lines would be owned by Metrolinx. The Metrolinx GO RER program is provincially funded, although the matter of the municipal contribution to GO’s capital remains a sore point between Queen’s Park and the GTHA. Toronto will pay for six new stations as part of SmartTrack and will also contribute to two stations on the Barrie corridor (Bloor/Lansdowne and Spadina). GO RER’s net operating costs will all be a provincial responsibility, and the amount of service that will actually operate depends on future subsidy levels for Metrolinx. Similarly, the full build-out of RER fleets, electrification and service levels will depend on future provincial budget decisions. The Relief Line remains under study thanks to a provincial infusion of $150 million, and both city and TTC staff emphasize that it is a necessary part of Toronto’s future network. While some relief to Yonge line crowding will come from GO RER and the new SmartTrack stations, this will only blunt but not stop the growth in subway demand. A big problem, as readers have discussed here at length, is the project’s scope and the perception that it is intended for a comparatively small part of the system’s ridership, downtowners. The further north the eastern RL branch goes beyond Danforth (to Eglinton or even to Sheppard), the more it performs a service for the city as a whole, but this benefit is routinely underplayed relative to the cost of a new north-south subway. Major capital spending for the Relief Line would not begin until the mid 2020s, but this will still compete with other city priorities. Waterfront LRT to the west is popular with councillors from southern Etobicoke and has begun to overshadow the shorter eastern LRT line in debates. Both parts of a future waterfront network are under review with the “Reset” study now in progress that has only progressed to the point of developing a moderately long list of options. The strategy appears to be to keep this list as open as possible as long as possible so that political fights over the details are held off at least until there is a better understanding of what will work and what the options might cost. Like the RL, waterfront transit has suffered from being perceived as a “downtown” project despite the scale of development it will have to serve. The Finch West LRT is still on the books, and Metrolinx hopes to begin work in this in 2017. There remains some opposition to the line, and it will be a test of the Wynne government’s resolve to see whether actual work is pushed back beyond the 2018 election. The Sheppard East LRT is also still on the books, although it is no secret that many politicians at City Hall and Queen’s Park would love to see this sacrificed for a Sheppard Subway extension. The LRT would be a provincial project with some federal money. There has not yet been any cost sharing commitment to a subway replacement from any government in part because the cost is unknown. It will almost certainly be greater than the LRT line, and like the extension north from Kennedy, will serve a considerably smaller part of Scarborough than the LRT would have. Any decision on this point is likely to fall to the next provincial government, although it will likely be part of the electioneering to reinforce the “subway champion” brand by all parties if this scheme gains traction at Council. The Richmond Hill extension of the Yonge Subway is a project long-sought by York Region, but the idea is tangled up with network relief from GO RER, the Relief Line and other capacity improvements still pending for the existing subway. Some of these, such as added operating cost for more trains on Line 1 YUS, and capital cost for station capacity impeovements, will fall to Toronto. Whether any of the funding pools now thought to be available for transit projects generally will still be available by the time a decision on Richmond Hill faces council, indeed whether this decision will even be in Toronto Council’s hands, are questions for a future beyond any of the existing governments. Not to be forgotten for its demand on city funding is the surface transit system including the bus and streetcar network. While billions in new projects preoccupy debates, a long-standing problem faces Toronto with population growth, much of it “downtown”, that has not been matched by additional transit. Indeed, transit service today is little changed from twenty years ago largely because the TTC streetcar fleet sits roughly at late 1990s levels, and traffic congestion has been responsible for service cuts to stretch the available fleet. Current operating budget plans at the TTC foresee a major shortfall in 2017 that appears unlikely to be addressed by a supposedly pro-transit council and mayor, and this will almost certainly continue into the 2018 election year. On the capital side, the TTC requires an additional batch of streetcars beyond the 204 now on order from Bombardier. Both the financing and supply of this fleet expansion are on shaky ground. As for the bus fleet, TTC management seems more preoccupied with simply replacing its existing fleet of hybrid buses with diesels rather than actually expanding the level of bus service to Toronto. In this context, the SmartTrack decision is only a small part, and Council has yet to be presented with a comprehensive view of the effect building a real transit network, rather than a few lines, will have on its budget and future financing requirements. Over some time there have been conflicting stories about the purpose of a backup power generation unit at the Mount Dennis maintenance facility on the Crosstown project. I have heard some rather wild statements from folks at Metrolinx that suggests they might be making things up based overheard water cooler chatter (not that offices tend to have water coolers these days, but it’s the idea that counts). I have heard stories both that its purpose is for on site emergency power and for traction power to the main line. Another variant is that less than full power would be provided in an emergency at least to clear trains from tunnels. It does not make sense to have one huge generator capable of providing traction power to the entire route. At a minimum, a parallel distribution system would be needed to connect to the standard substation-based feeds along the line. Also, emergency power requirements are different for traction (750 VDC) and station power (110/220 VAC). Do you really expect me to believe you plan a totally independent power distribution network from Hydro? Another cockeyed variant is to use the generator to offset peak power demands. Please provide a detailed technical description of what this generator is expected to power and under what circumstances so that there is a single explanation of this project from Metrolinx. I await a reply from Metrolinx that is coherent and credible. Metrolinx is working with Toronto Hydro to explore an alternative to the proposed natural gas powered back up facility near Mount Dennis Station. An alternative would have to provide the same basic functional requirements as the proposed natural gas powered facility. It would also be subject to any necessary approvals from the Province of Ontario and the City of Toronto. More info is coming in the near future I understand. building an 18 Megawatt backup power facility – six generators – (with capacity to heat the MSF office spaces) in the northwest corner of the MSF site, known as the backup power facility. c) Global Adjustment Peak Use: the peak amount of power needed during the time when Toronto Hydro’s network is a peak capacity. Each of the above peaks were assigned a $/MW or $/MW-h to determine the overall power costs of the project (that was unique to that proponent’s proposal). This cost was part of the proponents’ bid for the purposes of the financial evaluation. This regime exists to make bidders responsible for energy efficiency of their LRT system because Metrolinx will pay the energy bills for the 30 year Maintenance Period. The proposal from CTS to responded with a fully capable 18MW power facility with the ability to completely eliminate contribution to peak period on the grid. As a result of the proposal, CTS was able to reduce their evaluation costs for the Global Adjustment Peak Use and their Transmission Peak Use. If Toronto Hydro’s capacity is strained, how are we powering new facilities such as the TYSSE and proposed SSE? Does the TTC have to design for an alternative, power self-generation and transmission capability? How does this claim square with statements made during the GO Transit electrification study that at the provincial level, spare power for RER was not an issue at all? What additional capacity will be required to power the extensions to Pearson Airport and UTSC, and can this reasonably be sited at one location, Mount Dennis? The acronym used above “HMQE” refers to “Her Majesty the Queen’s Entity”, a short form for the combined Metrolinx and Infrastructure Ontario Entity. The primary purpose of the generator is supposedly for “Bulk Power Disruptions”, that is to say an outage from the provincial supplier, Hydro One. There have only been three such outages since (and including) the major blackout of August 2003. However, other explanations for the generation capacity emerge from time to time. In other words the primary function is to reduce electricity costs rather than simply having backup power. There is no business case to show how generating their own electricity would be cheaper for this line than direct purchase from a utility. Toronto Hydro requires additional distribution capacity for the Crosstown line and will have implemented this by the time it opens. However, this will not, according to Metrolinx, be in place soon enough to allow early testing. That statement does not explain just how much power testing would require as opposed to full operation of the line, nor whether Toronto Hydro is already capable of providing power for the testing phase. The City’s report also speaks of heat recovery for use on site and by nearby developments. This would only make sense if the generators were operating fairly regularly, not as occasional backup units. GO Transit’s RER power feeds will come directly from Hydro One and they will not be constrained by local transmission capacity. Metrolinx has yet to comment on power for the Crosstown extensions, but they have confirmed that the Finch LRT will not include a comparable power facility in its design. This entire scheme is looking more and more like a noble idea gone wrong. The specifications for this facility are in a section of the Crosslink project contract (“Output Specifications”, Schedule 15) that is completely redacted from the public version. It is intriguing that the contract contemplates the possibility that the cogeneration facility might be dropped from the project (section 20.18).